"Garlic, onions, and soy sauce with a touch of chili pepper to add interest and a little heat to plain white rice." Bring water and rice to a boil in a saucepan. 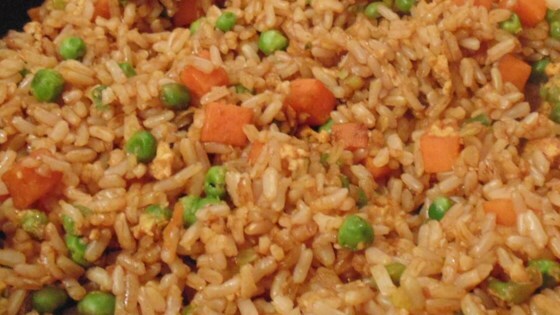 Reduce heat to medium-low, cover, and simmer until the rice is tender and liquid has been absorbed, 20 to 25 minutes. Cool. Melt butter in a large skillet over medium-high heat. Saute onion, garlic, and chile pepper in hot butter until fragrant and lightly browned, 5 to 7 minutes. Stir cooked rice, egg, soy sauce, and sesame oil into onion mixture. Cook and stir until egg is cooked through and rice is coated and heated through, 3 to 5 minutes. Use hot or mild chiles and adjust the measurement according to your taste. Garnish with additional chili slices so that your guests can add a little heat for themselves if they desire. If you are sensitive to salt, reduce the amount of soy sauce. If you want to make this a main dish just double the recipe and add some cooked chopped chicken, pork, beef or favorite seafood to the cooking step. Shrimp can be added to the cooking step raw since they only take a few minutes to cook but make sure the shrimp is cooked through before serving. We added jalapeños instead of chili peppers. Next time, we will add more peppers.